LONDON: Britain should not give preferential treatment to European Union workers in its post-Brexit immigration system but should prioritize the higher-skilled, a report commissioned by the British government said on Tuesday. However, the Migration Advisory Committee (MAC), an independent body which gives the government advice, also said Britain may be able to offer preferential access for EU citizens in return for other benefits in Brexit talks such as trade. With just over six months to go until exit day, Britain has yet to agree its divorce or future ties with the bloc, and businesses are increasingly concerned that the country’s future immigration strategy will shut the door on much-needed workers. “If … immigration is not to be part of the negotiations with the EU and the UK is deciding its future migration system in isolation, we recommend moving to a system in which all migration is managed with no preferential access to EU citizens,” the committee said in a report. The MAC was clear that its suggestions were based on the assumption Britain was setting its own migration rules without the constraints of any possible Brexit deal. Worries about immigration were prominent among voters who backed Brexit in the 2016 referendum. Prime Minister Theresa May has pledged to end unrestricted freedom of movement when Britain leaves the bloc but has so far given little detail on what the rules will be. If a Brexit deal is reached, Britain and the EU have said people will still be able to move, live and work on the same basis as now until the end of a transition period in December 2020. The government said it would consider the recommendations before setting out further detail on the future immigration system. “The government is clear that EU citizens play an important and positive role in our economy and society and we want that to continue after we leave,” the interior ministry said. Supporters of Brexit have regularly cited the pressure EU migrants have put on services such as education and healthcare as well as on house prices as a negative effect of EU free movement. But MAC chair Alan Manning said the impact of migration from the EEA – the European Economic Area which covers the EU plus Iceland, Liechtenstein and Norway – had been modest and higher prices caused by the fall in the value of the pound after the Brexit vote had most probably had a bigger effect on Britons. EEA migrants contributed more to the health service than they consumed and there was no evidence migrants had reduced access to schools, the report said. While there was some evidence migration had increased house prices, these had also been affected by other government policies such as house-building. The MAC report recommended the cap on those coming to Britain under “Tier 2” visas, currently for skilled workers from outside the EEA, should be abolished and that it should be opened to medium-skilled jobs. The committee said it did not think there should be regional variations to any future immigration system and it did not recommend a system for low-skilled workers, with the possible exception of seasonal agricultural worker schemes. The government has said fruit and vegetable farmers would be able to recruit non-EU migrants on temporary visas after Brexit to help ease labor shortages during busy periods. While business groups welcomed some aspects of the report, such as scrapping the Tier 2 cap, they cautioned that shortages of EEA workers could cripple sectors such as construction. They also called on the government to set out its plans soon to reduce uncertainty for businesses. “We strongly urge the government to prioritize a reciprocal preferential agreement with the EU on movement of people and labor, reflecting the unavoidable realities of close geography and integrated supply chains,” said Stephen Martin, Director General of the Institute of Directors. 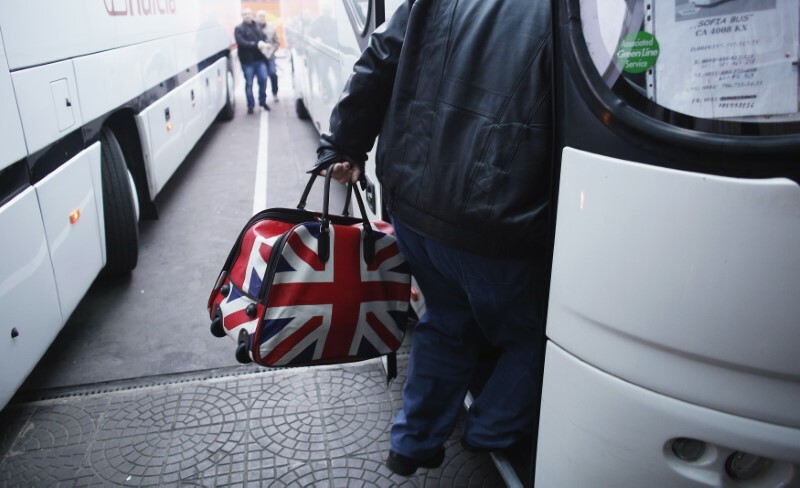 Net migration of EU nationals into Britain has already fallen markedly since the referendum, with official figures in August showing levels dropping to their lowest since 2012 in the year to March. The UK government has repeatedly failed to meet its aim of reducing annual net migration to below 100,000. Asked about having such a cap post-Brexit, Manning said it was a political target rather than immigration policy. “If you want to influence flows it is much better to vary things like the salary thresholds and the immigration skills charge than it is to have hard caps and quotas,” he said.